Disclosure: I was compensated by Life of Dad and Snyder’s of Hanover for my participation in this promotion. Sometimes packing for a day trip with kids seems more daunting than packing for a month long African safari. It doesn't have to feel that way though. 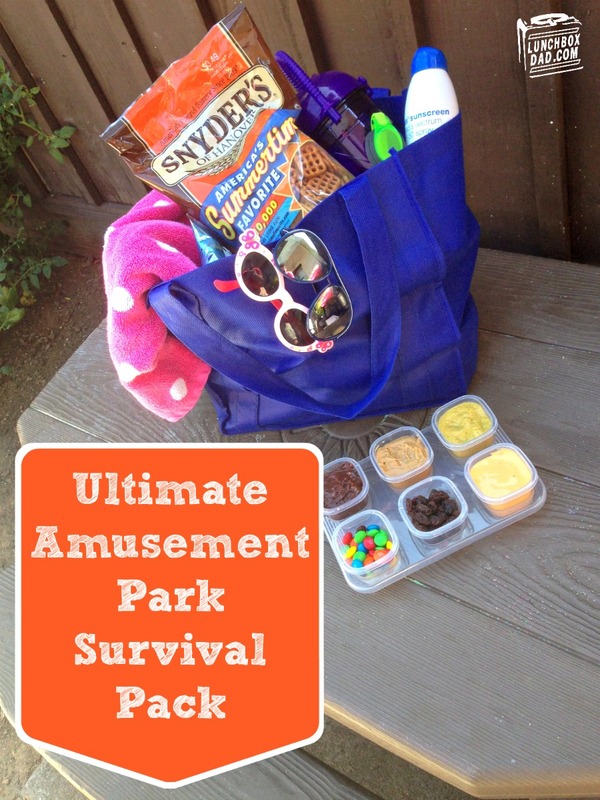 When you head out to your next trip to the amusement park, use this handy guide to make your own Ultimate Amusement Park Pretzel Survival Pack. This pack has everything you need to make your amusement park trip a success, from clothes to the best snacks. Read on to find every supply you will need as well as a chance to win $10,000 in America's Summertime Favorite Sweepstakes. We took this survival pack out and road tested it to make sure it was absolutely perfect, and thanks to Snyder's of Hanover's pretzels, it was. The first thing you need to pack is protection for your kids and you. Sunscreen is a must. We like the spray kind because it covers well and it is fast to apply. You also must remember a hat and sunglasses. This goes for your kids too! Take the extra 5 minutes after you get out of the vehicle to cover your family well. 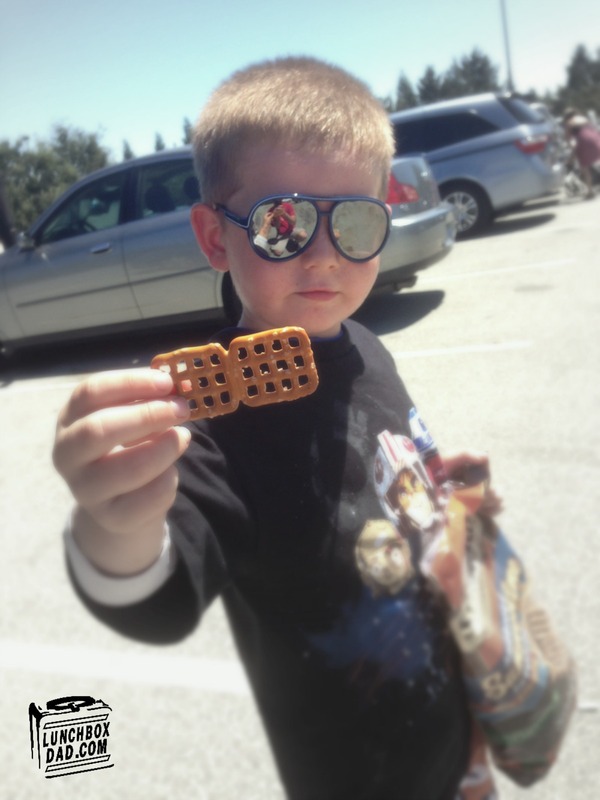 If your kids are anything like mine, then good snacks are a must. 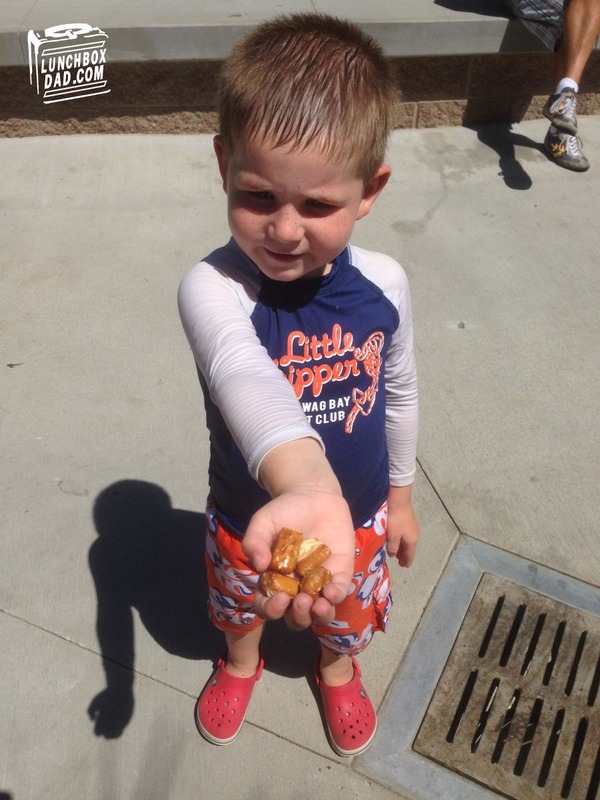 Snyder's Pretzels saved us on our latest trip. Not only are they healthier than those greasy, artificially flavored chips, but they satisfy your snack craving with the awesome crunch. 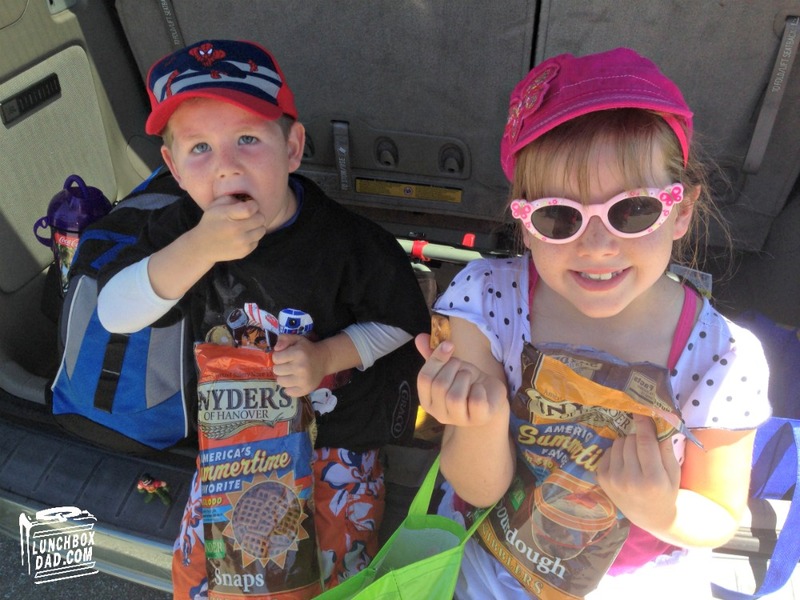 We brought along Snyder's Sourdough Nibblers and Pretzel Snaps. My kids could barely keep their hands off of them. We thought it would be fun to add a little extra so we brought dips for the pretzels as well. All you have to do is use small, resealable, reusable containers and ice packs to keep the dips cold and in their place. We took a few sweet and a few savory dips. On the savory side we brought cheese sauce, peanut butter, and dijon mustard (the adult's favorite). For the sweet tooth we packed chocolate spread, m&ms, and raisins. It was also fun to double dip. For example, first in the peanut butter, then in the raisins. Or chocolate and then the M&Ms. Also don't forget to bring along water or your local amusement park's reusable souvenir cups. Many times you can fill them with ice water for free at the park. If your destination has a water park inside it, you should also be prepared by bringing swim goggles, beach towels, and a change of clothes. You will want to bring the sunscreen in with you, especially if you will be spending an extended time in the water park section. A little hint about water parks. You will get wet. Your stuff will get wet. Your snacks will get wet. There are a million little kids splashing and running around. It is not humanly possible to leave a water area in an amusement park without getting something soaked. The beauty of our snacks being pretzels is that they seemed to have a supernatural moisture barrier. I'm not making any guarantees but those pretzels did not get soggy and held up like champs. Score one for Snyder's. As you can see, this survival pack helped us throughout the day. No one got sunburned, no one was dehydrated and no one went hungry. In fact, when you have snacks at an amusement park, kids attack you like packs of ravenous wolves, so make sure you bring extra. We met up with friends there and the kids devoured our pretzel supply. If we wouldn't have brought extra, we would have been sorry. Snyder's Pretzels also come in many great varieties such as pretzel sticks, sourdough nibblers, pretzel butter snaps, pretzel snaps, and mini pretzels. 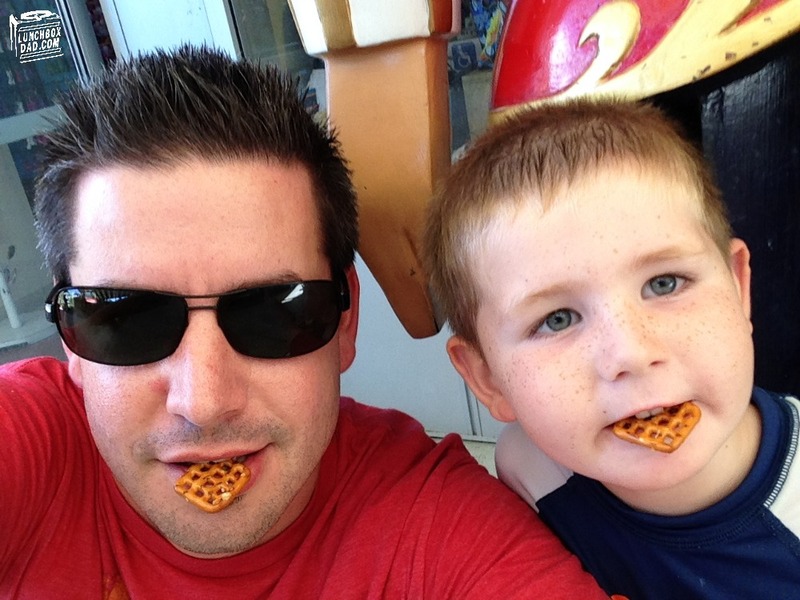 My son and I even took a little detour and found a great place to take a pretzel selfie along the way. Even in the midst of a hectic day, trying to hit as many rides as possible, don't forget to stop and allow those special moments with you and your kids. They are what make the day worth it! Another important thing to remember is that you can win $10,000 from Snyder's. Check the Snyder’s of Hanover Facebook Page weekly and participate in the America’s Summertime Favorite Sweepstakes for a chance to win 10,000 towards your family vacation! 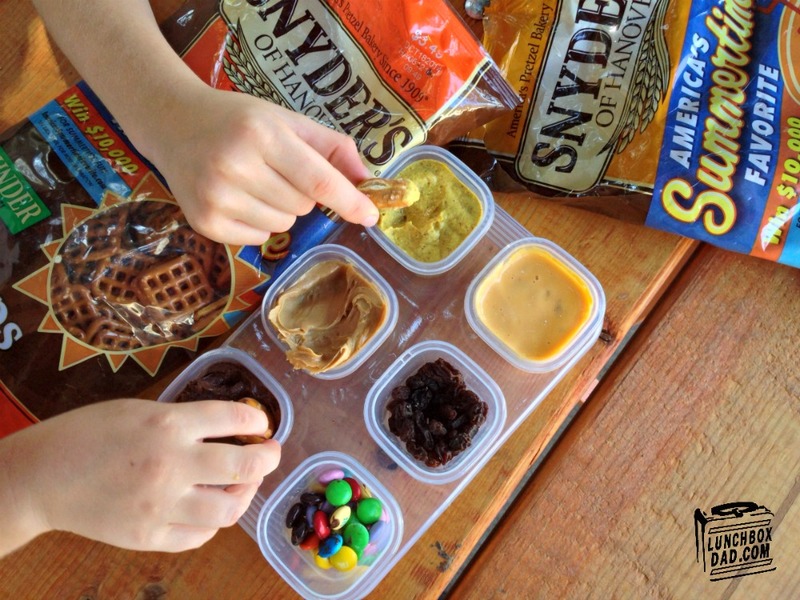 Also search #PretzelGuys on Twitter and Facebook to see more ideas for pretzel survival packs and see creative ideas for how people are using Snyder's Pretzels! I would love the fruit for my kids; however, I think my kids would much rather have the mac & cheese. I have to come up to San Fran and meet you all...I'll bring the Snyders! Awesome giveaway! Love the eco box! Fingers crossed for a box-o-pears. We'd devour those 6 Packages Pasta O’s from Pacific Foods. But we love everything else as well! The pears and the solo cube. My kids want to win the Pasta O's and the pears! Their favorite foods!